It’s a tough market for traditional advertising. Virtually every sector will see a drop this year, except one: outdoor advertising. What’s driving the growth? Intense interest from large tech companies advertising on billboards and even buying into billboard companies. Plus, new technology allows better digital tracking of who seeks billboards. Not to mention the fact that some billboards end up being photographed and shared as memes on social media. While Facebook touts its targeted online adverting and rakes in billions, the social giant is actually pushing its own marketing campaigns to the physical world. Case in point: Facebook recently ran an outdoor advertising campaign to showcase its approach to user safety and privacy. And Google is now bringing targeted ads to outside advertising after three years of testing programmatic ad technology on billboards. With an emphasis on transit points and the times and people who show up there, the company is banking on targeting ads toward these populations. These might be affluent commuters or die-hard soccer fans, as Bloomberg’s Alex Webb explained. Although a recent AP investigation is drawing attention to the ways Google tracks your location without your consent, this very location-targeting — assuming users are aware it’s on — is what will give Google an edge in serving relevant outdoor ads. 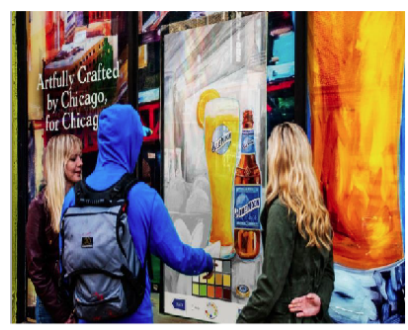 The renewed interest in old fashioned outdoor advertising is not just an American phenomenon. Chinese e-commerce giant Alibaba, for one, has invested $2.23 billion in Focus Media, a company based in Shanghai that operates outdoor digital advertising screens in China, Singapore and Hong Kong. The move goes back to Alibaba’s “online-to-offline” strategy, also referred to as “New Retail,” that Alibaba hopes can be an alternative way of reaching China’s growing middle class. Of course, billboards today are much more than static images. Digital billboard advertising can switch screens every 10 seconds or so. And with their size, (especially if you’re stuck in traffic) they’re hard to ignore. Clever ad campaigns on huge digital screens can prompt viewers to share the experience of the ad on social media. Clear Channel Outdoor Holdings, which operates more than 1,200 digital roadside billboards in the U.S., uses mobile data from third-party providers to know which phones are passing in front of billboards. Despite all the interest from tech firms, the buying process for billboards is still complicated and byzantine. To circumvent some of these issues, Reddit co-founder Alexis Ohanian is now backing a startup, AdQuick, that hopes to smooth the process of purchasing billboard ads. AdQuick has secured $2.1 million to develop targeting and measuring tools. This included what CEO and co-founder Matt O’Conner hopes will include voice technology like Amazon Alexa or Google Home. The idea is that passersby will be able to ask digital voice assistants to ping billboard information directly to their phones. Online advertising may get all the credit for being hyper-targeted. However, for some companies, this kind of targeted advertising is also possible when you’re in the right place at the right time. Netflix, for example, bought half the assets of Regency Outdoor Advertising, a Los Angeles-based company, in a $150 million deal. Its focus: Sunset Strip. But while Los Angeles is happy to plaster the highways with billboards, not every city is so welcoming of them. Nearby San Diego, for example, has long fought “sign pollution and visual blight,” but could be affected by a new California bill that would loosen the rules on outdoor advertising and allow more digital billboards. With the amount of potential revenue these advertising campaigns offer, though, this could be a tough bill to fight. The opportunities for outdoor advertising seem endless with the right amount of investment and creative technique. Viewers might not always be happy about being bombarded with yet another advertisement — but then again, when are they not? The question is whether new technologies and interest from tech companies can truly make billboards a long-term growth story, or just another blip in the tech boom.